Bijuu Arena / Re: Naruto vs Kamui: The Tanuki and Fox Struggle Once Again! Kurama merely smiles in response to Shukaku. While the feeling is almost mutual, part of Kurama's nature would hold back from opening up to much. He simply hopes his Tailed Beast brother understands his approving silence. In the physical world, Naruto sits up as Kamuiapproaches, taking notice of the Strength of a Hundred, recognizing its appearance from a book he read in the Uzushiogakure Grand Library. He nods in response to Kamui, "I'm sure it won't feel that ba-OW! Watch it!" The Jinchuriki winces in at the discomfort, overreacting a smidgen as he looks like hes trying to hold back tears. But t doesn't take long for any trace of pain to suddenly subside, causing Naruto to look in surprise at the effectiveness of the healing jutsu, any scrape, mark or bruise disappears in the wake of the Strength of a 100. His eyes light up at the presence of mechanical limb, truly fascinated by technology. He couldn't even begin to imagine how the thing worked, hes lucky enough to get the remote working at home. Naruto starts to laugh a bit, reminiscing on today's events, testing out the new limb by flexing each individual digit, "Heh...I guess I can't call you Robo-pops anymore huh?" His grin widens as he extends out his organic arm towards Kamui, inviting him for a fist bump, hoping this will be the start of a great friendship. Not long after he initiates the gesture, his belly would begin to growl loudly, "Haha..mind if he get something to eat before we go back?" He says, rubbing his empty stomach and looking rather hungry. If agreed, Kurama would spend the extra time accumulating himself back to full strength while the two shinobi take their time getting back. Forged in the heat of battle a new bond forms, built from the clashing of wills. Instead of tearing down, this encounter had made the two men stronger. Their desires to Never Give Up not only broke through the limits of their physical strength, but through the hate and malice that plague the human heart. The resulting explosion would consume the sky in a blaze of glory, large enough to be seen from miles away. The combined might of both their attacks would scar the land even deeper than before as a cataclysmic storm erupts from it, bathing the land below them in a sea of lightning strikes and hurricane force winds. Such an attack, as his opponent says, would strip them of their cloaks, sending them hurtling to the ground below. Naruto's body lands on the opposite side of the Valley from the Uchiha, crashing into the ground. The impact leaves a small impression on the hard but still hot floor. Like Kamui, he gets up struggling at first before his own Healing Power begins to kick in, panting heavily. His entire jacket would have been destroyed in the explosion and he would have reverted back to his Base Form. In his response to Kamui, Naruto would think. Voices echoing from the past would bring to the forefront of his mind his Nindō, his Ninja Way, "No matter what challenge you present before me, I'll never back down. To protect the village, my friends, and my partner, i'll give every ounce of who I am! KAMUI!" After finally acknowledging the Uchiha's name, Naruto arches back his arm, jumping forward to meet his opponent half way with a fully charged Rasengan. Backed with tremendous raw force, drawn out from sheer determination. Naruto's Dokonjō Rasengan meets with KamuiKagutsuchi: Chidori, both their wills fighting for dominance. Neck and neck, the two attacks prove equal. The standstill in power generates a discharge of bright multicolored chakra, devouring the floor of the Valley of End. As the light engulfs him, Naruto smiles at Kamui. It had been awhile since their first encounter, and Naruto never once thought he would grow to respect the man who tried to kill him. However, here he is, taking a bit of pride in the strength and fortitude of his "teacher". He understood his desire in taking Kurama wasn't out of malice or some greed, but out of a pure heart. 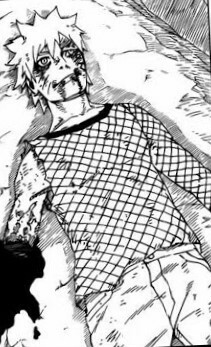 Naruto reflects in his mind, as explosion begins to ravage his arm to shreds, that sometimes good people fight among each-other for the sake of equally good goals. Any hatred he may have had for him fades as the light does, ushering in a new night as Sun goes down. Moments after the great eruption devastates the land further, Naruto finds himself lying face up, his eyes greeted by an ocean of stars in the sky. A little disoriented, he looks around, finding that one of his arms had been completely blown apart by the clash, "Damn..." He says, not really angry or seemingly phased too much by it other than a minor annoyance. He goes to wipe the blood coming from his mouth, but instinctively does it with his dominant hand which had just been destroyed, "Oh..thats right.." The shinobi then looks around for any signs of Kurama to the left or right of him while he stays face up on the ground. Within the Mental Dimension shared by all Tailed Beasts and their Jinchuriki,Kurama begins to speak to Shukaku, "Heh, you didn't do as bad as I thought you would." The Fox was rather stubborn and prideful, not wanting to give the Racoon-Dog too much credit. Not exactly the best compliment, but from Kurama this was a big step in the right direction of being a bit cordial with the One Tails. As the clones are destroyed, the spirit of Asura would sense the chakra of his Brother and Father in the ethereal plane, causing his influence over Naruto to become more prominent. So much so in fact that for a brief moment Naruto himself takes the appearance of the ancient Otsutsuki before reverting back to his normal self. He could tell that charging Lightning Release chakra was a power of devastating proportions and he needed to meet that strength with something potent of his own, "You're strong, but bond between Kurama and me can overcome any obstacle! Our power rests in our unity!" Unbeknownst to the Uzumaki, in the deeper reaches of his psyche, the same elderly voice that spoke to the Uchiha speaks to Kurama while Naruto remains unaware, "It seems even Asura is impressed with your Jinchuriki, Kurama. Out of all the previous incarnations, hes never become so in tune like he is now, I'm happy you've made such a worthy friend." The Nine Tails would almost be at a loss for words, it had been so long since he heard the voice of his creator, giving him comfort and satisfaction at these turn of events. "Old Man...hes always surprising me. Whenever it looks like hes down and out, he manages to shatter through the shell of his limits into new heights, but its not just that..." "Oh?" Responds the Sage of Six Paths[/color], interested in what else peeks the Tailed Beast's interest about the Uzumaki. "Ever since I was sealed in the kid, i've given him nothing but grief in both mind and body, but that didn't stop him from trying to forge a bond with me, fighting through my hate. Even now he fights on to preserve our friendship." Hagoromo chuckles, "The shinobi of this generation sure are a special sort. The one with Shukaku especially, theres a kind of pureness in his resolve that I haven't seen for a long time. Indra and Asura's power face off in a battle not filled with strife or malice, but in an untainted rivalry. You and Shukaku can learn a thing or two from them!" Laughs the Sage as his voice gets softer, fading away from Kurama's mindscape. "Hey! Pay attention!" Shouts Naruto , bringing the Fox's focus back on the fight as the Uzumaki decides to enter back into his subconscious, completely missing Hagoromo in the process, "I've got an idea, but I'm gonna need more power from you in order for it to work..." Naruto gave a stern look at Kamui as he draws back his bow, his power was incredible. If Susano'o wasn't bad enough, he had both Shukaku and Kurama's chakra coalescing within it, making it a god-like avatar of destruction incarnate. Kurama ponders Naruto's request for a moment before responding back, "Because you were so reckless, Kamui absorbed a good portion of my power, so there isn't much I can do on my end. Why not use that thing taught to you by those wrinkled old toads?" "Hm? You mean Sage Mode? Last time if I recall, you stopped me every time I tried to use it with your power..." The Tailed Beast fires back, "Idiot, this is different! Before, I didn't want to share space with a slimy amphibian, but we're comrades now. So lets synchronize our might!" The Uzumaki nods in delight as he makes the clones surrounding him begin to meld together into his Tailed Beast Mode, creating a giant three-faced, six-armed construct. Next he would remove from his weapon pouch one of his Natural Energy Pills, swallowing it. The ingredients forcibly draw in Natural Energy from the environment into the boy's body and almost instantly, he would balance that energy within him, combining his Tailed Beast Mode with his Perfect Sage Mode,"Whoa..." Naruto is taken aback mass of chakra created, so much so that even a non-sensory type shinobi would be able to feel his power within the country,"We're new to this form so we've only got one shot at this Naruto!" In the real world, the construct would begin to form two gigantic attacks within their hands, one a mammoth sized Bijūdama Rasenshuriken, capable of easily destroying multiple planetoid-like objects in one blast. The other hands would generate an equally large Wind Release: Ultra-Big Ball Rasenshuriken, "Lets go!" He shouts at his opponent before tossing the attacks towards him. In unison, the spirit of Asura yells with Naruto the name of the attack, "Six Paths: Ultra-Big Ball Rasenshuriken!" Sensing the Amaterasu begin to rapidly head his direction, Naruto channeling the sunlight as he moves himself higher in the air to avoid the deadly black flames of Hades itself. Once the light fades, Naruto opens his eyes to be met with the gargantuan purple chakra cast. As the colossal Susano'o stands before them, Naruto for a moment is in shock. Hes never seen a Susano'o take such a drastic transformation and reach such drastic height in power before, but this would not deter the Uzumaki . In his Mental Realm, he talks with the Nine Tails about their current situation, "It appears hes somehow taken my chakra and is blending it in with the power of that oversized rodent!" Kurama says in disgust. He notices that while he may be concerned, Naruto is grinning like an idiot, balling one fist and slamming it into the palm of another. His Tailed Beast would be frustrated at Naruto's elated attitude, "What the hell are you smiling about? Don't tell me this excites you?!" The man couldn't help but chuckle a little, his Biju was right, "I dunno Kurama...for some reason when I saw that Susano'o...something felt like it woke up inside me, like a long forgotten memory beginning to spark. I kinda felt like that when all this talk of Sage of Six Paths started, as if I knew it in my soul and I just needed a reminder." Naruto's Will of Fire would become a blazing inferno inside him, his desire to never give up despite the odds would flare something to life in him that was long since dormant. Kurama looks at his Jinchuriki in shock as he senses a familiar power rise from him and sees an echo from ancient times appear behind the Uzumaki, "No, it can't be...could it?" Naruto crosses his arms and gives his friend a puzzling look, "Whats wrong? It looks like you've seen a ghost" Standing directly behind him would the chakra apparition of the Senju and Uzumaki progenitor, Asura Ōtsutsuki. In the physical realm, Naruto appears to gain inspiration and a new fighting drive, as if possessed. He has the chakra head of Kurama form a massive Tailed Beast Bomb. Using Kurama's ability to supercharge his Bijudama, he would create one with the equivalent power of 5 Biju at once, firing it off as a penetrating wave instead of a ball. Using his Chakra Levitation Technique, Naruto guides the blast as an omni-directional laser if needed, able to make the swiftest turns in order to chase down Kamui if needed. He makes sure the blast comes in contact with some of the Amaterasu in the air, setting it on fire. This would greatly amp up the penetrative power of the beam to burn throw objects in its path, essentially combining the Super Tailed Beast Bomb with Kamui's Amaterasu. Meanwhile, Naruto himself forms a handseal, "Shadow Clone Jutsu!" creating a total of four copies of the Nine Tails Chakra Avatar. Two of which stay by the original while the other two attempt to charge Kamui, all flying. Using their powerful tails they would attempt to slam into the Indra's Complete Body - Susano'o in order to try to crush the construct between the two Nine Tails. The clones that stay behind the original seem to be in a meditative state, as if they were preparing for something. It was nice attempt in order to try to make sure his Takamimusubi hit, exploiting the weakness of the seal upon Jingu Bang to absorb one jutsu at a time. However, merely stopping the Jingu Bang from absorbing the jutsu didn't end up with Kamui's desired outcome. While he may be using one disadvantage of Jingu Bang against Naruto, the Uzumaki on the other hand had capitalized on multiple weaknesses of Takamimusubi. In order for the shadow=red,left]U[/shadow]chiha's jutsu to work, Naruto would have to be within his line of sight, which was immediately obstructed by the Sage Weapon. Second, the chakra would have to actually come in contact with Naruto, an aspect his opponent failed to take into account with his counter strike. A shield, by the end of the day is still, well...a shield and it still acted that way in regards to the pulse of chakra. Much like how an umbrella guards one from precipitation, the gigantic shield would block the chakra from coming into contact with him, giving him enough time to teleport the Kirin. With these two undeniable facts working in Naruto's favor, Kamui would be subject to the mighty power of Kirin, not paying attention to the clone at all, he would be blindsided by both the Armored Susano'o destoying power of the Lightning Bolt, and the Humanoid Susano'o obliterating power of the Tailed Beast Flash Barrage. If not annihilated by the resulting explosions, Kamui's body would be left at the mercy of a sea of lava, plunged into the depths of newly heated area to face Hell on Earth. Meanwhile, the original, still hovering in the air would launch anther devastating attack below upon his foe. Using his giant Chakra Arm to act as a giant Fresnel Lens, Naruto simulates the attack he used upon Kamui their last battle. He'd unleash upon his foe a powerful beam of sunlight, drowning the area around them in blinding light as pure concentrated heat well over 2000 degrees descends upon Kamui. Closing their eyes and using their sensory abilities, the Narutos are able to protect themselves against the continuous blinding light as well as keep track of Kamui if he still lives after the Kirin and Tailed Beast Bomb combination. With this attack being composed of pure heat and moving as fast as Thermal Radiation, sensing it or seeing it coming would be seemingly impossible, especially considering the constant light blinding the use of Sharingan. Naruto wouldn't be caught so easily off despite the quickness of his opponent's attack as he would respond like he did in their last encounter, but this time the Uchiha was fighting against a much swifter and perceptive Naruto than the one he fought last. Instantly responding to the Will of its Master, the Uzumaki's Ruyi Jingu Bang would instantly appear in front of him in the form of Giant Shield, adorned with a Chakra Absorbing Seal, the "father" of the spiky haired shinobi's jutsu upon his palms. It was a close call, but the Pulse of Chakra would intercepted from coming in contact with thanks to his Sage Weapon. The clone close to Kamui, knowing what the Real Mccoy had done, would keep the shield suspended via Chakra Levitation. Not only would the chakra be intercepted, but the shield would be big enough to conceal him completely from Kamui'sview, a repeat of what happened between them a few months back. Without a pause in his use of Guiding Thunder, he would end up guiding the thunder towards Kamui, as stated prior, before the heat could have the chance of damaging the Hiraishin Mark, especially since the clone had tossed it from the air where the heat would be less concentrated. Lastly, the clone would activate the Tailed Beast Bomb he kept from previously, the second Tailed Beast Flash Barrage with the same potency as the first fired at Kamui. He would do this if the Lightning manages to strike his location, adding to the damage and destruction of Kirin, capable of shattering and melting a Humanoid Susano'o on its own power, as well as the other effects his previous one entailed. This would include, but not limited to, creating more lava in the area, covering the untainted area around Kamui if it strikes and clearing the Acid Release Gas away from them. Unless quick and drastic measures be taken by his opponent, he would find himself engulfed by both the deadly Kirin and Tailed Beast Beast Bomb, resulting in a magnificent explosion of tremendous power. He would then proceed with the Shape Manipulation of one of his Chakra Arms as intended. However, if somehow Naruto's attempt fails he ends up struck by the Kirin, sending the Uzumaki careening into the ground below. The potent electricity devastating the environment and leaving a massive crater where it hit the floor, the lightning pushing Naruto into it before the Acid could make contact. Moments after, a giant golden chakra hand emerges from the impression, pushing up against the lava drenched floor would rise a colossal and translucent golden fox, emerging from the smoke. The corrosive gas in the area would suddenly draw into the beast, into Naruto's palm, sealed away into his Advanced Sealing Method. Like Kamui in his Susano'o, the young man floats within the chakra construct panting slightly, but not from exhaustion. The Kirin left its impact upon him and it showed, however the durability in his Kurama Mode provided a strong enough defense against lightning. As mentioned before, Naruto's initial form was strong enough to protect him against such powerful moves such as Natural Disaster Befalling Heaven and Earth, which itself is composed of many natural lightning strikes and his durability is even more so in his Kurama Mode, being simply a compact version of his Tailed Beast Mode. Without a word, the man controls the Chakra Avatar of his Biju to slap his hand with violent force into the ground. Such great power causes a huge tidal wave of earth and lava to race towards his opponent right before Naruto unleashes from one of his seals, Wind Style: Rasenshuriken while the Nine Tails takes control of the avatar, forming 4 uncompressed Tailed Beast Balls, "Sync with me Kurama!" Quickly both would fire off their attacks, the Bijudama circling around the Rasenshuriken. Controlled by Naruto's chakra, the jutsu follows right behind the wave, attempting to hide the attack behind it, making itself known whether or not his opponent stops the tidal wave. If successful, the Tailed Beast Planetary Rasenshuriken threatens to cut into Kamui with mountain slicing force and explode into an explosion that can be seen from miles away, able to disintegrate objects as well as decimate the Chakra Circulatory System even if he survives, rendering him unable to perform jutsu. Naruto's control of it would allow for the Uzumaki to change its trajectory in a sudden fashion if necessary. Posts on hold until deliberations between both parties and the judge are concluded. While the battle had become increasingly more intense as time went on and his opponent proved himself to be a very deadly and tenacious foe, Kamui had made one very drastic mistake that should result in his immediate death. That mistake is not having a very careful understanding of his environment. Surrounding Kamui for nearly a mile would be lava spanning every direction, aside from a small area around him which he protected himself via Tenma Kōfuku. It landing within that range would cause the object to be incinerated upon contact, destroying the seal and leaving his opponent subject to a swift beheading, the Chakra Chains neutralizing his chakra to try to prevent any last minute shenanigans. However, Naruto wouldn't be surprised if his opponent somehow survived even though his own actions would end up destroying his own means of escape. If he not only survives but proceeds with his original course of actions, the Uzumaki strangely enough would be prepared such an occasion. The moment he appears outside the grasp of the bunshin, the two collide as predicted, causing them to disperse and return their remaining chakra to the original. Thanks to his opponent inadvertently helping Naruto by vocally pronouncing his next attack, he would open up a window of action for Naruto between his words and the time it takes for the Streak of Lightning Chakra to reach the skies above. Thankfully, as noted by his opponent, his attention would be on the original, most likely leaving what happens next go unnoticed. Perfectly synchronizing their activity at the most crucial moment, the clone would toss a marked kunai towards his foe while the original simultaneously activates one of the seals on his outstretched hands. Though insanely hot, the kunai and seal would survive, even the briefest of moments being enough. If successful, his opponent would be entirely consumed by a an obliterating bolt of lightning going faster than the speed of light, the power-up granted by Shukaku wouldn't make much of a difference in this situation. Kamui and Naruto 's plans had been very similar, allowing the seamless counter of his own jutsu. Originally, the shinobi had planned to attract Lightning similar to Kirin to himself, which is why his arms where outstretched to the heavens and the Lightning Barrels in his Chakra Arms. He was going teleport the electricity away from himself to one of his clones below to bathe the Uchiha in a sea of natural lightning by using the Flying Thunder God: Guiding Thunder sealed away on his hands, activating by sheer will. With the Kirin warped away at the last possible second, it would be seemingly impossible for Kamui to anticipate and react accordingly as Naruto gave no telltale signs of what exactly he had planned. With First Hokage also not paying attention to the clone until after the launch of Kirin, he would be hard pressed to somehow escape the clutches of the mighty thunderstrike. Lastly if his opponent survives, the original would sprout single large Chakra Arm in addition to the others towards the sky, applying Shape Manipulation as he readies himself, glaring at his opponent. Meanwhile Kurama would take a little pride in the fact that a previous Jinchuriki of his has proven powerful so far, looking forward to seeing how he would deal against yet another power hidden within Naruto . Naruto's clone had in fact directed the beam at the ground of the Wood Release Dragons, and not Kamui directly and it was the ground beneath him that would ignited into an explosion. So if anything the area still drastically changed save for space around Kamui as he activates his Tenma Kofuku, pushing the blast away from below away from himself. "...be very aware of your surroundings and the abilities of your opponent." Sound advice that the Uchiha should have taken to heart himself as the Uzumaki wouldn't be caught off guard so easily this time around. As the terrain ravaging sphere of Magnetic Chakra begins to sprout from him and travel towards the Narutos, all of them, thanks to their Mental Connection, would be in one accord as to what to do. Simultaneously all the Uzumaki would let out a penetrating shout, the intense pressure of Tailed Beast Shockwave meeting against Kamui's Shinra Tensei-like discharge would act as a Diversion Dam. Like a large boulder jutting from a waterfall's edge, so is Naruto and his clones to Kamui's Demon Pacifier, each bifurcating the magnetism into streams. With the Tailed Beast Shockwave acting as a shield, the clones wouldn't lose a beat in their charge towards their opponent, while the others also remain safe. Now as his clones would be but inches away as his opponent pointed out, Kamui would conjure up the ghastly black flames of Amaterasu, believing himself to be safe from the onslaught because of the Chakra Chains only upon a single limb. However, because he was so focused one arm, the other would most likely go unnoticed before its too late. The clone behind him (thus also being out of his direct line of slight) would activate the Advanced Element Sealing Method upon his other hand drawing away the Amaterasu before the Shape Manipulation turns it into deadly piercing spikes and allowing the two too strike. Lastly, the clones apply the Shunshin Technique to their movements boosting their speed tremendously for an instant. If they were close to slicing off Kamui's head before, such speed in conjunction with how close they are should seal the deal in the battle. With the strain put upon the eye from Amaterasu as well, reacting properly, or even at all to the clones at this point would seem hopeless as bell tolls for Kamui's life. Meanwhile, the extreme temperatures in the once beautiful landscape would be well above the Curie Temperature of Gold, making well beyond the boiling point of water. This ultimately means that once the water droplets leave their cloud haven, they would be met with the heat of a burning inferno, evaporating them. As the heat rises, it should cause the gas to move upward as well. This leaves a sort of constant cycle of precipitation, condensation, and evaporation before it even touches the Narutos. The Naruto in the air would use two Chakra Arms to remove two distinct Lightning Barrels from his weapon pouch, placing them right on the palms of his open hands as he seeming waits for something if his opponent miraculously survives. Due to their connection with Kurama, all the Narutos are able to be in perfect sync with their actions thanks to Tailed Beast Telepathy as they would be in constant communication for different actions. In response to Kamui 's statement about this being the beginning of the end, he would reply sternly with, "I couldn't agree more.." Though the sky above rages,Naruto is only momentarily interested, perhaps because it bore no current threat to him or his clones and he was focused on ending the Uchiha right here and now, attempting to give him no chance to pull off something sinister. Sensing the Wood Dragons begin to burst forth from the Earth below, one of the Kage Bunshin would create two miniature version of the Tailed Beast Bomb in both hands as him and his comrades ascend quickly further into the air, but still out of range of the Magnetism in the Sky, "Tailed Beast Flash Barrage!" By utilizing a combination of a Bijudama variant of Spiraling Serial Spheres and Rasengan: Flash, the clone fires a Katon infused laser of devastating energy capable of clearing explosions at the ground below the Wood Dragons. Contact would cause the ground below both the Dragons and Kamui to ignite in a massive blast capable of shattering and melting a Humanoid Susano'o. The heat from the attack would be so tremendous that it would result in a similar landscape it would have been if the Lightning Barrels were uninterrupted. Kamui 's Gold Dust would be rendered inert for protection and the flames that consume the ground would burn to cinders a Wood Release: Hobi Technique, leaving little room for escape, as it covers about 1000 yards. If successful, the copy's attack turns the damaged rocky terrain into lava that threatens to burn and trap the Uchiha in place if he wasn't blown to bits, still maintaining the other Tailed Beast Bomb in his other hand. The attack and AoE would of course be sweltering, reaching well beyond the Curie Temperature. Immediately afterwards, the other two Bunshin would use their tremendous speed to charge the Jinchuriki if he still lives, moving so fast that when compared, Lightning Release: Body Flicker seems like a brisk walk. With one striking from the front and the other from behind, they form a scissor like effect, both with immense Tailed Beast Strength. If their hits land, the two arms would most likely decapitate their opponent. With a single Chakra Chain wrapped around the attacking limbs, contact would neutralize Kamui 's chakra, negating any chakra amped durability his body may have had, making decapitation swift and easy. Meanwhile the original remains high in the air, arms lifted up. His eyes would be closed as if hes concentrating on something. His chakra would flare causing a pulse of light to emanate from him, standing out like a sore thumb amidst the darkness that now covers the area around them, "Even though we didn't meet on the greatest of terms, I'd like to thank you for helping me grow. Even if you didn't intend for it, because of you, Kurama and I have gotten to where we are now. I hope to meet you again one day, whether in this life or the next. Who knows? Maybe we could even be friends...C'ya..." What exactly was the Uzumaki thinking? One could assume a sense of arrogance, as his words bear behind it a quiet promise of destruction. But yet, it could equally be an acknowledgment of his opponent's strength, as Naruto himself possibly recognizes that he too can die here on this day. However, he wasn't go out without making his mark, to shake the world with his existence, this fight being his testament upon every challenge hes faced so far, his hopes, his dreams, and all of his passion Kamui was about to face it all. The shinobi wouldn't be too disheartened at the counter to his counter attack as it meant him and Kurama could still demonstrate what they're really made of, "Its time Kurama ..." As his defense begins to corrode away, Naruto and the Nine Tails synchronize further, digging deep into their wellspring of chakra. An enormous burst of energy escapes from the shinobi as he lets out a primal roar. Immediately the untainted air that was in his orb pushes both forms of mist away from his person enough to leave significant space for the ninja. But this display wasn't just for show and pushing away the mist, it was spark that would lead to an inferno. Instantly various lines appear around his shroud as it now resembling a full length haori, the whisker marking upon his face become thick black rectangles and his pupils slitted like a Red Fox. Once stepping into Kurama Mode, Naruto officially entered a compact version of his Tailed Beast Mode. His physical abilities increase drastically once again, becoming vastly stronger, faster, and more durable. Immediately after transforming, which took a split second, he would manifest all nine of Kurama 's Chakra Tails. After quickly applying Shape Transformation to them, he turns an edge of them into impressively sharp blades, curling them around his entire body. Before the mist can recede back upon him, Naruto quickly twists around with a shout, unleashing a cataclysmic attack upon the battlefield. Combining the Kyuubi's brute strength with Tailed Beast Shockwave, Naruto sends a deadly ripple of pressure of destruction of mighty slicing strength as it extends out from in 360 degrees, leveling the area around them. With enough might to slice mountains apart, the shockwave threatens to tear both Kamui and his Ecliptic Meteor asunder, called the Tailed Beast Sabre by the Uzumaki. The sheer speed and range of this technique make it difficult to evade as it would not only cover the ground below, but the air above, reaching miles out in but a few seconds. This of course disperses away the corrosive mist and normal mist as well, giving them both clear visibility. With his opponent being only 20 feet from the epicenter of the blast, a strike would be seemingly most assured. Following up the attack, Naruto forms a handseal shouting aloud,"Shadow Clone Jutsu!" Generating three perfect doppelgangers that surround him in the air. If his opponent somehow survives, he'd be able to see a most serious look upon the Jinchuriki's face unlike before. It was clear from here on out that Naruto wouldn't hold back like Kamui wanted, his eyes burn bright with both courage and solemnity, his body exuding pure raw strength, monumental and unbound. Toying with Kamui was no longer on the table, a chance of subduing without causality a forlorn ideal. Before the Earth was now two peerless warriors, ready to up-heave a world of cardboard. Anger towards the older man would fade, his transgressions now clouded by a trance of undiluted survival instinct, focused, clear and precise. Could the Uchiha hope to match up with the Uzumaki in Kurama Mode even in his Magnet Release Chakra Mode? "Good grief!" The Jinchurki and his Bijuu would both exclaim but for entirely different reasons. Naruto was surprised at what a powerhouse Kamui was as he was able to counter his technique. There was indeed much for the Uzumaki to learn, but his ingenuity would make up for that in spades. Kurama on the other hand would be irked by the Tanuki's presumptuous and haughty attitude, though that sentiment would be a bit rich coming from the Nine Tails, probably the most arrogant Tailed Beasts in regards to power, "I'm sure you're well aware that Foxes eat Tanuki in nature, and I'm feeling a bit peckish ya damn oversized badger!" Though tempting, the Nine Tails waits patiently for his Jinchuriki to desire to transform further just to show the One Tails who's boss. As Kamui would initiate his Hiding in Mist Technique, Naruto stops his descent, remaining in the air about 20 feet from the magnetic beast, Kamui. Privately within the Mental Realm only shared by him and Kurama, the Fox chuckles at the events unfolding, "I can't believe you knew that would happen exactly. Did you have this planned all along Naruto?" The boy snickers as he rubs under his nose with his index finger, "Like clockwork!" He says with a nervous chuckle, trying to sound confident. Of course, this wasn't entirely true, but to pass up a moment to seem greater than he was? Not a chance.Before the mist comes into contact with him, Naruto would prepare his defenses by creating a myriad of Adamantine Sealing Chains that wrap around him in a small dome, giving him a powerful and personal fortification. Though it wasn't to protect him against the mist itself. One his Chakra Arms would reach into his weapon pouch and pulls out a Lightning Barrel with a seal at the bottom. Using the same speed as before, the Chakra Arm throws the weapon outside behind him (as the shinobi can allow what he pleases to pass through the barrier), activating soon afterwards. The seal upon it unleashes a substantial amount of Lightning Barrels, generating a devastating attack. The intense electricity combined with the mist makes a deadly combination as the close together water molecules help the lightning move extremely fast as Kamui's own jutsu acts as a gigantic conductor. This increases the damage of the lightning enough to turn the surrounding rock molten (made easy thanks to Kamui's contributing stark heat). If touched by the electricity spanning the entirety of the mist and if not burned to a crisp, it threatens to cause Kamui's muscles to involuntarily contract, paralyzing him. This would also be effective in damaging technology if it happens to make contact. The extra heat produced had the added benefit of not only making the ground dangerous to come in contact with, but helped with demagnetizing of objects by reaching Curie Temperature. Narutodidn't slack around when it came to this fated encounter, he had prepared himself to win once he met the Uchiha in battle once again. Thankfully Naruto's already prepared barrier protects him from the current and heat. Lastly, the pièce de résistance, Naruto uses his Advanced Element Unsealing Method,"returning a gift" to Kamui he had absorbed from his during their last encounter. A bit poetic in a way, Kamui continually contributes to his own downfall. Narutointended to use this jutsu to track down Kamui if needed, but now its being used against its creator in such a way that it would be nearly impossible to detect due to RoboPop's own actions. Because he filled the area with mist, he not only blocked the vision of his Eternal Mangekyo Sharingan, but virtually every direction would be composed of his Chakra Signature, blending the attack perfectly into the environment, concealing from sensory abilities. Since Naruto wouldn't move from his original position, detecting something akin to Negative Emotions (if that indeed what his opponent was implying) would only go so far and not give enough to give detailed information on what hes doing behind the scenes of the smokescreen. If successful, every inch of the area around Kamui would be dangerous, from the electricity giving paralysis, to the molten rock trapping and/or burning him, his Gold Dust (including technology) rendered inert from demagnetization, and finally the near impossible to detect Beat Punches being the last nails in the coffin to pulverize Shukaku's Jinchuriki to paste. But how would Naruto know where Kamui is in this dense fog? A certain ability to detect Negative Emotions within others played its part to assist the Uzumaki in finding him as well as Kamui's own Magnet Release Chakra Mode. Even if he didn't have Negative Emotion Sensing to help, Kamui had effectively turned himself into a living beacon, easily detectable by the strongest concentration of heat. Naruto would seem to have become overtaken by the insanely hot downburst of wind, knocking him further up into the air with its initial emergence. His opponent was surely no joke, such an awe inspiring display of power would not go unrecognized in Naruto's eyes. Just like the environment and falling rocks around them, the Uzumaki would seem to catch aflame and it looks like his clothing would slowly burn to cinders. It would almost look like he was defeated by the eruption of power, but a smirk creeps up on his face as he'd remain airborne. As he sets himself upright mid-air, he looks as if the fire around him wasn't bothering him at all. Partially, this would be due to his incredible endurance and Saisei Nōryoku, healing his body as it receives damage. Kurama smirks along with his friend, "Hmph, it looks like we're going to have to embarrass you in front of your Jinchuriki you petulant Raccoon! You're not the only one who has gotten stronger!" Using the Chakra Levitation Technique, Naruto would be able to control himself and objects akin to a form of telekinesis, granting him the ability to fly like the Earth Release: Light-Weight Rock Technique. As he rockets himself towards Kamui, the Uzumaki would show gratitude towards the Uchiha, "If it wasn't for you, Kurama and I wouldn't have reached this new plateau. I'll show you a form that our friendship achieved by breaking through our barriers!" Its true, in an ironic twist of fate, it was Kamui who helped him excel. From their fierce encounter, Naruto had learned the Fox's name and had gained new incentive to grow stronger, finding out through Kamui and Shukaku's co-operation that Jinchuriki and Biju could be comrades. Now this "student" was prepared to show his "teacher" a lesson he'd hopefully never forget. As he descends the fire seems to increase around him, yet he seems unbothered. Finally the flames engulf his entire person, but this was just the catalyst to something marvelous. Like a cocoon shielding a growing caterpillar, the fire around Naruto Uzumaki was merely Kurama's power filling his entire being as they transcend to a higher level. Erupting from the fading flames would be the Kyuubi's Jinchuriki, clad in a golden aura, emanating from him reminiscent of flickering flames. Two chakra horns appear on his head and six magatama marks around his neck. Various lines cover his entire body but most prominently a swirl design forms on his stomach, looking very much like the fabled Sage of Six Paths who he recently learned about. In his Initial Nine Tails Chakra Mode, Naruto's physical abilities are enhanced multi-fold. He becomes strong enough to wrestle with a Tailed Beast, and faster than the Lightning Release: Body Flicker Technique. His durability increases as well, giving him great resistance to heat and its strong enough to protect him from attacks such as the Tenpenchii. His eyes become bright orange and he lets out a powerful atmosphere of Life Force Energy. After producing a myriad of Tailed Beast Chakra Arms from his back, Naruto unleashes a flurry of punches towards Kamui, though they do not stretch to far from Naruto's body. Demonstrating something else he learned from his opponent, Naruto essentially had copied the man's Beat Punch from their last encounter. However, instead of Sound Release Chakra, Naruto concentrates the Tailed Beast Shockwave into his punches sending devastating waves of pressure and destruction at his foe at tremendous speed, spanning the distance between them in moments. These pressures of air would continually push the hot air away from Naruto and back towards Kamui, with enough impact to give a similar feeling to if being hit by a Shinra Tensei. He'd follow Kamui if he happens to move, attempting to pelt him with forces capable of demolishing cliff sides. This would be evident by the fact that whether it hits the Uchiha or misses, the stress on the environment would be too much as the cliffs on the side of RoboPops would start to crumble. This would open up new canals for the water flowing from the river if successful. Of course, the potent heat produced by Shukaku's Jinchuriki would begin to turn the massive amounts of water to steam, slowly filling the area with a hot mist.